Super Bowl parties and salty snacks go together like peanut butter and jelly. Tortilla chips, potato chips, snack mix, pretzels: Salty snacks are the perfect finger food for any sports event. They’re cheap to buy, easy to share, and you can find them just as easily at gas stations as you can at the supermarket. These snacks are called “salty” for a reason. Check your food labels: Most are laden with multiple forms of sodium from plain old salt to monosodium glutamate (MSG), and many are laced with artificial flavors. Some even throw in some trans fats and artificial colors. Before habitually tossing a bag of chips into your shopping cart, take a quick look at the ingredients to discover what you’ll actually be eating. You want to be able to concentrate on the game, not deal with headaches, numbness, or an asthma attack–all symptoms which the Food and Drug Administration reports may be related to eating foods containing MSG. There are just as many salty snacks made from “clean” ingredients as there are made with potentially harmful ones. Several makers of salty snacks, including Frito-Lay, have already removed unhealthy additives such as MSG, artificial colors & flavors from many of their products. You won’t have to look far to find a better alternative. Tortilla chips: Tortilla chips are a fixture at Super Bowl parties, but if you’re buying flavored chips, spy before you buy. The ingredients label will reveal what the product contains. Instead of: Doritos Nacho Cheese single-handedly could’ve put the “junk” in “junk food” with its laundry list of bad ingredients, including MSG, trans fats, and artificial colors, just to name a few. Try: Garden of Eatin’s Nacho Cheese or Kettle Brand’s Tias! These snacks taste just as good but come with a much cleaner list of ingredients. DIY: Serve plain or baked tortilla chips (read the label first to make sure they don’t contain Olestra. It can cause diarrhea and reduces your body’s absorption of some nutrients) with Big Game favorites salsa, chilli, and guacamole. Microwave popcorn might sound like the best thing since sliced bread, but the bags are lined with PFOA, the harmful Teflon chemical linked to cancer, and the “artificial butter flavor” used in many brands of microwave popcorn may contain the chemical diacetyl which has been known to damage lungs, among other chemicals. Try: Newman’s Own Organics Pop’s Corn or Orville Redenbacher’s Natural Line. DIY: Impress your friends (or your kids) with air popped corn. Add real butter and salt yourself, or a squeeze of lime. If you’re on a calorie budget, fill a super-sized bowl with plain popcorn seasoned with chili powder or hot chili pepper flakes. Spicy foods boost calorie burning. Snack Mix: This might just be the ultimate Super Bowl snack. It conveniently combines several favorite salty snacks into one bowl. Instead of: It’s not possible to find a prepared snack mix that doesn’t contain MSG, partially hydrogenated fats (trans fats), artificial colors or flavors and other dangerous additives. Chex Mix Traditional Snack Mix contains numerous artificial flavors (don’t let the “whole wheat” in the ingredients fool you into thinking it’s healthy). Boston’s Snack Mix has fewer artificial flavors but about the same amount of sodium, 320 mg per half cup. Chester’s Snack Mix has trans fats, and sadly, Quaker Brand Snack Mix Kids Mix contains artificial colors and flavors, including MSG, and deadly trans fats. DIY: It’s easy to make your own Super Bowl snack mix by combining your favorite shredded oats cereal (try Barbara’s Bakery), cheddar cheese crackers (Late July’s are fantastic), lightly salted or peanut butter pretzels, dry roasted soy nuts, chickpeas or lentils, and some miniature bread sticks (if you like them extra crispy, find a brand made from spelt). Mix all the ingredients together in a large bowl, season with 1 teaspoon hot sauce and some cayenne pepper, and sprinkle with Parmesan cheese. If you want to take it a step further, preheat the oven to 300ºF, toss in a little olive oil (about a tablespoon), spread the mix on a baking sheet and bake for 30 to 40 minutes. Potato Chips: Most plain potato chips are made with potatoes, oil and salt. It’s the flavored varieties you have to worry about. They typically have many more ingredients that provide taste—some are better than others. Instead of: Flavored potato chips (even the baked ones) often include MSG as a seasoning. Herr’s and Great Value (Walmart brand) are two such offenders. Also, avoid the super-sized bags if there are only a couple of spectators in your TV room watching the game. DIY: Buy plain potato chips to dip into an all-natural sauce such as Simply Organic French Onion Dip Mix, Sisters Dip & Sauce, or Guiltless Gourmet Spicy Black Bean Dip. Read the ingredients on dips and sauces, too. You never know what they might be hiding (like MSG). Good luck to your team this Sunday! You don’t have to give up junk food to eat healthy—just make smarter choices. Discover yummy alternatives to your favorite treats. 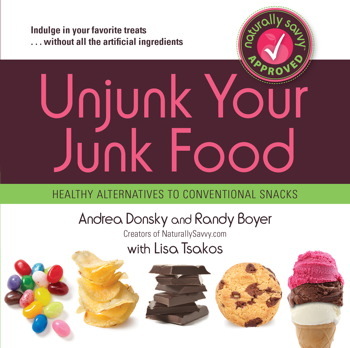 Unjunk Your Junk Food is a quick and easy guide.